Over the last few years, the Test Pilot team has developed innovative features for Firefox desktop and mobile, collaborating directly with Firefox users to improve the browser – from reminders to return to a tab on your desktop to a simple and secure way to keep track of your passwords. Today, just in time for the holiday shopping season, the Firefox Test Pilot team is introducing Price Wise and Email Tabs — the latest experimental features designed to give users more choice and transparency when shopping online. These game-changing desktop tools are sure to make shopping a breeze with more options to save, share, track and shop. We’ve also made a few updates to the Test Pilot program itself to make it even easier to become a part of the growing Firefox users testing new features. Online comparison shopping is more popular than ever, but it’s often hard to know when to buy to get the best deal. With Firefox Price Wise, you can add products to your Price Watcher list and get a desktop notification automatically every time the price drops. Users can even click through directly from their list to purchase as soon as the price changes, making online shopping more affordable and efficient. The feature is currently only available in the U.S., and works with products from five major retailers: Best Buy, eBay, Amazon, Walmart, and The Home Depot. This list of retailers were among the top 10 visited by Firefox users and we’re working to expand to more retailers in the future. While there are many tools to help users share and save links when browsing, research shows that most of us still rely on email to get the job done – a manual process that requires multiple steps and services. We think there’s a better way. 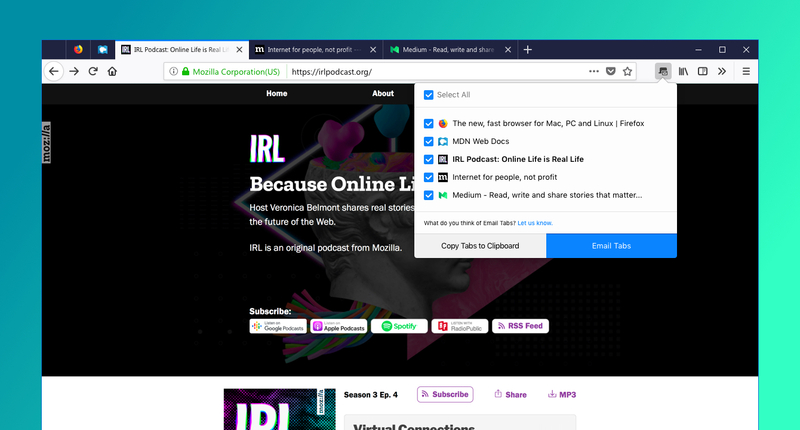 With Email Tabs, you can select and send links to one or many open tabs all within Firefox in a few short steps, making it easier than ever to share your holiday gift list, Thanksgiving recipes or just about anything else. 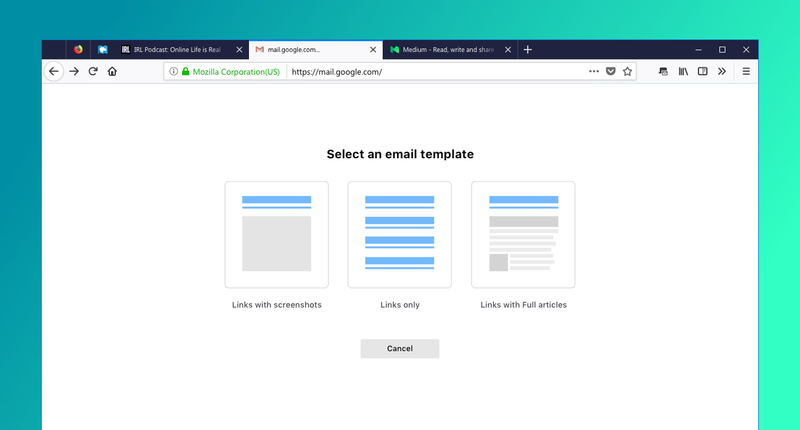 To start, click the Email Tabs icon at the top the browser, select the tabs you want and decide how much of the content you want to send – just the links, a screenshot preview or full text – then hit send and it’ll automatically be sent to your Gmail inbox. How about saving the links for future reference? Email Tabs also lets you copy multiple tabs to Clipboard for outside sharing. The feature only works with Gmail right now, but we’re working on adding more clients in the near future. This will be seamless if you’re logged into Gmail already, if not you can always log in once you’re prompted. And of course, the best part of Price Wise and Email Tabs? With Firefox private browsing and content blocking features, you can shop online with extra protection against tracking this holiday season. We appreciate the thousands of Firefox users who have participated in the Test Pilot program since we started this journey. It’s their voice and impact that have motivated and inspired us to continue to develop features and services. Thanks to their support, we’re happy to share that several of our experiments are ready for graduation. Send, which lets you upload and encrypt large files (up to 1GB) to share online, will be updated and unveiled later this year. Our Summer experiments, Firefox Color, which allows you to customize several different elements of your browser, including background texture, text, icons, the toolbar and highlights, and Side View, which allows you to view two different browser tabs in the same tab, within the same browser window, will graduate as standalone extensions. We’re always working to improve our Test Pilot program to encourage Firefox users to participate and provide feedback on the latest Firefox features. With this version of Test Pilot, we’ve simplified the steps to make it easier for users to participate than before. To learn more about our revamped Test Pilot program and to help us test and evaluate a variety of potential Firefox tools, visit testpilot.firefox.com.